Breastfeeding is recognized as a crucial intervention to provide infants and young children a healthy start in life. It is the single most effective intervention for saving lives: if applied globally, optimal breastfeeding can annually prevent about 830.000 deaths of children under 5 years. Unfortunately, out of 135 million babies born every year, almost 83 million are not enabled to follow optimal breastfeeding practices. Enshrined in the article 24 of the Convention on the Rights of the Child on the right of the child to the enjoyment of the ‘highest attainable standard of health’, breastfeeding should be protected against marketing practices that could undermine it. Therefore, the Committee has integrated the 1981 International Code of Marketing of Breastmilk Substitutes (the Code), to date completed and extended by fifteen subsequent relevant WHA resolutions forming an integral part of it, in the CRC General Comment No. 15 (2013), which specifies that besides the States’ obligation to implement and enforce the Code (para 44), baby food companies have the direct obligation to comply with it in all contexts (para 81). However, the misconduct of baby food companies continues to be a key cause for poor breastfeeding practices, as these companies reap profits from promotion of their products which directly compete with breastfeeding. Recently, the report Breaking the Rules 2014, published by IBFAN’s International Code Documentation Centre, presented more than 800 Code violations by 27 companies in some 81 countries. Since democratization of new technologies and Internet access, a new avenue has opened up for companies to advertise their products on digital media, including social media such as Facebook and YouTube. Mobile and web-based technologies using ‘behavioural targeting’ offer them new opportunities to interact directly with mothers, despite the fact that the article 5 of the Code prohibits baby food companies to seek direct or indirect contact with pregnant women and mothers of infants and young children, regardless of the mean used for making that contact. Popular bloggers, especially mothers, are roped in to endorse products and thus influence their huge following. Advancing their electronic marketing even further, companies are developing mobile software applications (known as ‘apps’) that millions can download onto their mobile phones, tablets, laptops and PCs. Companies use these apps as direct promotional tools. Several apps are designed to ‘help’ pregnant women and new mothers. Special offers, discounts, contests, product launches and campaign announcements are now available to tech-savvy young mothers and their families. Websites facilitate baby food companies’ contact with mothers by offering them gifts (such as a trip to Singapore), free samples and discount prices (such as a ‘Ramadan special package’, offered by Hero on its Egyptian online shop). Encouraging mothers to spread the word about their products, companies’ websites also foster their participation through a wide range of social activities, such as, for example, photo contests for babies, invitations to baby fairs or mothers blogs. Thousands of mothers are linked to companies through their Facebook, Twitter or Pinterest pages, where offers of free gifts, promotions and ads violating the Code are regularly posted. Some of these pages even offer ‘live chats’ or ‘carelines’ through which mothers can talk directly to company personnel to get nutritional advice on infant and young child feeding. Besides, many other companies have developed a phone app for monitoring the feeding routines of infants and for providing advice, such as the one developed by HiPP in Norway. In Slovenia, Novalac even offers parents a local language smart phone ‘baby app’ which allows the company to offer promotions and special deals to parents. 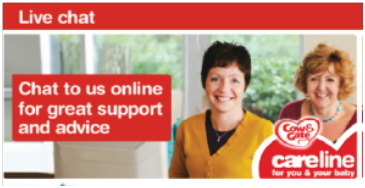 A new trend for companies is to promote virtual platforms called ‘Nutriclub’, ‘Moms club’ or even ‘Baby club’, connecting with pregnant women and offering mothers one-on-one support, parenting advice, information about pregnancy and child development, together with information on their products. When joining a ‘club’, mothers are offered gifts, promotional offers and invitations to try products. For example, parents who sign up to Wattie’s club are offered the chance to win about USD 520 of free gifts. 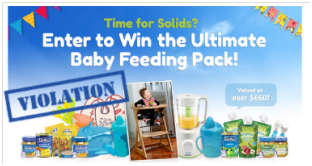 Baby food companies are regularly publishing attractive video clips on their websites and social media, but also on TV and as ads on other websites. These video clips are systematically ‘shared’ on YouTube, allowing them to be spread over social media by users. For example, a cute cartoon video clip, recently published by Nestlé, has been viewed over a million times within a month. The 1000 days between a woman’s pregnancy and her child’s 2nd birthday is a critical period for long term development. UNICEF and WHO have launched a global campaign for health and development through adequate nutrition during this critical ‘1000 days window of opportunity’. Baby food companies sensed a marketing opportunity and launched their own ‘first 1000 days’, campaigns. Both Nestlé and Danone, baby food leading companies, have co-opted the slogan of the first 1000 days. Nestlé launched its own first 1000 days advertising campaign called ‘Start Healthy, Stay Healthy’ in order to associate itself with the UN message. Under its campaign, the company reaches out to the public through its website and social media and calls on visitors to join the company in promoting the World Breastfeeding Week 2014 while claiming to support breastfeeding. Apart from targeting mothers, Nestlé sponsors courses organised by professional organisations and even organised ‘scientific conferences’ for doctors in India, despite the explicit prohibition of such events by the Indian Infant Milk Substitutes Act. In Malaysia, the company has pushed the boundaries even further and launched a ‘1500 days’ campaign. 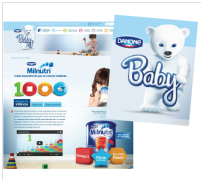 For its part, Danone registered the domain name http://www.first1000days.ie/ under its Nutricia subsidiary. In China, Dumex’s 1000 Days programme, with emphasis on child’s immunity, offers a service tailored for mothers and aimed at providing advice from pregnancy through various stages of early childhood. A book on this 1,000 day programme is distributed free when mothers register on the Dumex website. In Ireland, Danone’s front company Cow & Gate followed the Dumex example by launching the First 1000 Days campaign, using a celebrity couple as ambassadors. Incentives like free recipe books are offered to tempt potential customers. It is crucial for Member States to fully implement the Code as it regulates marketing practices of baby food companies to protect the right to health of infants and young children, including against malevolent marketing practices that take place online. More specifically, article 5 of the Code prohibits manufacturers and distributors from providing mothers with free samples of their products, whether directly or indirectly. The provision also forbids promotion tools to induce sales direcly to the consumer at the retail level, such as special displays, discount coupons, as we can find on companies websites, their online shops and social media. Finally, the Code states that the marketing personnel should not seek direct or indirect contact of any kind with mothers of infants or young children. Resolution WHA63.23 calls upon the development of legislative, regulatory and effective measures to control the marketing of breastmilk subtitutes in order to give effect to the Code. According to the Code, monitoring the application of the Code lies with governments acting individually and collectively through WHO (article 11). Resolution WHA61.20 urges States to scale up efforts to monitor and enforce national measures and to avoid conflicts of interest. To meet their obligations, States should therefore be urged to implement deterrent sanctions for Code violations into their legislation. Governments should promote and support optimal breastfeeding practices through modern and attractive media campaigns. Using the same digital media devices than baby food companies, States parties would be able to counter the damages induced by the aggressive marketing practices of the private sector. By maintaining catchy and helpful websites, promoting social media pages and spreading innovative videos through the Web, governments will be able to disseminate the adequate information to a wider public and create a popular trend towards optimal breastfeeding practices. According to the CRC General Comment No. 15 (2013), baby food companies have a direct obligation to comply with the Code in all contexts and thus, to respect to right of the child to the enjoyment of the highest attainable standard of health. Pursuant to international human rights law, States have the duty to ensure that companies based in their territory do not infringe the human rights of people their countries, but also in other countries where the companies operate. Therefore, the States should be urged to implement legislation aimed at holding home-based companies, including baby food companies, accountable for their human rights violations abroad. Hero is a Swiss company. For example, by May 2013, the Danone Facebook page had received some 53,000 ‘likes’, thus multiplying Danone’s Code violating record. HiPP is a German company. Novalac is a French company. Wattie’s is a brand owned by Heinz, a US company. Dumex is the Asian subsidiary of Danone, a French company.